Who knows anything about this organization? Above the woman's head the three words Woman's Benefit Association are repeated in the banners. The initials beneath her are O.T.M. 273 may be the chapter number. This was found in Broome County NY. The WBA is a part of the Order of The Maccabees which explains the globe and the OTM. I have a scrapbook which is not in good condition and it has a clipping entitled Remarkable Tribute to Supreme Commander Bina M. West of the Woman's Benefit Association of the Maccabees. It includes a drawing of their new home office in Port Huron, MI, and pictures of the 5 Supreme Leaders - Supreme Finance Keeper, Supreme Medical Examiner, Supreme Commander, Supreme Record Commander, and Supreme Lieutenant Commander. I tried scanning it but it turned out very poorly. Of course there is no year mentioned but the meeting was held on June 18. The clipping was put in this scrapbook because an Alba, PA, native was named Supreme Medical Examiner in 1902. She passes away on a June 25, no year, possibly 1919) and was buried in Woodlawn Cem., Elmira. 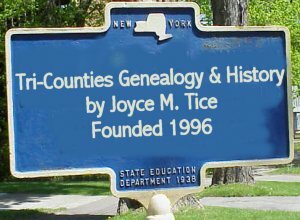 If you can't find out any information any other way, maybe one of the Elmira list members could look her up in the Cem. records for her death date and then maybe you know someone in or near Port Huron that wouldn't mind looking up the article in the newspaper if it didn't appear in the Elmira paper. 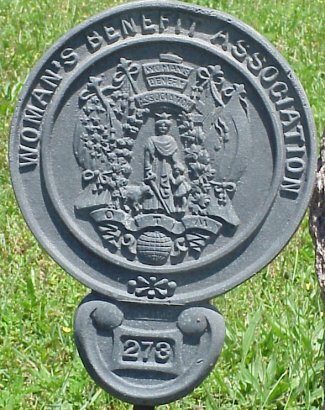 (from 1902 to her death date) The clipping states that at the convention it was brought up for a decision to change the name from the Ladies of the Maccabees of the World to the Woman's Benefit Association of the Maccabees. Elizabeth Merritt Hooper, for many years a resident of Elmira, died on Wednesday, June 25, at her home in Port Huron, Mich. Her last visit to Elmira was on March 11 last, when she came to bury her husband, Charles W. Hooper. At that time she was in apparent good health. About three weeks ago she was taken suddenly very ill with uremic poisoning, and from the severity of the attack, there was no hope of recovery. Notwithstanding the efforts of expert specialists, she failed to rally and the end came yesterday. A funeral service will be held in Port Huron on Friday afternoon, and the body will reach Elmira on Saturday, at 12:45 o'clock via the Lackawanna Railroad, and the funeral service will be held in Woodlawn Chapel at 2 o'clock Saturday afternoon. Elizabeth Merritt (Hooper) was born at Alba, Pa., April 10, 1860. She attended the Woman's Medical College in Philadelphia, Pa., and graduated in 1883 with high honors. In 188? she was married to Charles W. Hooper and settled in Elmira, living on Second street, near Walnut, where she practiced her profession with eminent success. In 1902 she was appointed supreme medical examiner of the Woman's Benefit Association of the Maccabees. She continued her general practice in Elmira in connection with her official work till 1907, when she found it necessary to abandon her medical practice and removed to Port Huron, Mich. where the head office of the order is located. The order is nation-wide, and the performance of her official work kept her at high pitch constantly to keep pace with the growing requirements of the position. Last year the largely increased number of deaths occasioned by the influenza epidemic, taxed her endurance to the breaking point. In addition to this, the illness and death of her mother, followed by the death of her husband, caused her sudden break down. Dr. Hooper was a woman of nerve, energy, and the highest order of ability, and had been remarkably efficient in her profession. She was one of the best lady physicians in the country, and Elmira suffered a great loss in her retirement and removal from the city. She was admired and loved by all her patients and co-workers and had many close friends in this city who will deeply mourn her untimely death. She had made friends in Port Huron who will miss her sadly. She was a woman of wonderful executive ability, and the order will find it hard to fill the position she occupied so ably for 17 years. I just looked up Elizabeth Hoopers death on the St. Clair County site by Suzette Bromley http://www.rootsweb.com/~mistcla2/ . She's listed as dying in 1918. If you're interested in the obit, Suzette supplies a link to the library. Perhaps someone from the St Clair County list can look it up for you. The library charges.